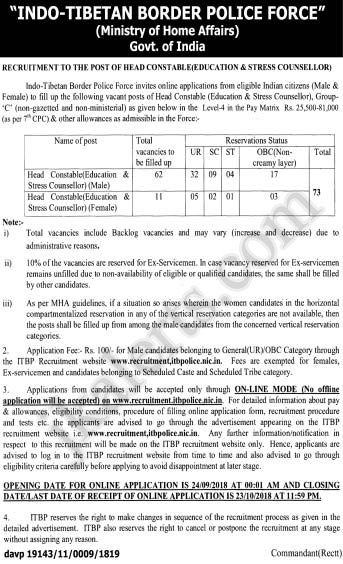 Indo Tibetan Border Police ITBP Force Head Constable Recruitment 2018 Online application. Applications are invited from eligible male and female Indian citizens for filling up the vacancies for the posts of Head Constable (Education and Stress Counsellor) in Group ‘C’ (Non-Gazetted & Non-Ministerial), The posts have All India liability and selected candidates can be posted anywhere in India and even abroad. Applications from candidates will be accepted through ON-LINE MODE only. No other mode for submission of application is allowed. Head Constable Level -4 in the Pay Matrix Rs. 25500 – 81100 (as per 7th CPC). Head Constable Level -4 in the Pay Matrix Rs. 25500 – 81100(as per 7th CPC). Candidates belonging to General (UR)/ OBC category applying for recruitment to the above posts should pay Rs. 100/- (Rupees one hundred only) as application fee through online payment gateway system on www.recruitment.itbpolice.nic.in. Application received with any other mode of fee payment will be summarily rejected. Candidates belonging to females, Scheduled Caste, Scheduled Tribe and Ex-servicemen are exempted from paying fee. i) Fee once paid will not be refunded under any circumstances. ii) Fee paid by modes other than above will not be accepted and the applications of such candidate will be rejected forthright and the payment made shall stand forfeited. CLOSING DATE / LAST DATE OF RECEIPT OF ONLINE APPLICATION: 23.10.2018.